The U.S. Navy denied Thursday reports on bolstering its presence in the Eastern Mediterranean theater through the Sixth Fleet to guard Exxon Mobil's oil and gas exploration for the Greek Cypriot Administration off Cyprus. A number of unconfirmed sources that reported on Tuesday that ExxonMobil's vessel will be protected by Iwo Jima amphibious ships of the U.S. Navy's 6th Fleet. On Feb. 11, Turkish warships stopped the Saipem 12000 rig belonging to the Italian energy firm ENI as it headed toward an area southeast of Cyprus. Answering to an inquiry by the Daily Sabah, a spokesperson for the fleet said there is "no truth to the allegation that the U.S. 6th Fleet is in the Eastern Mediterranean to protect ExxonMobil." The official added that the Iwo Jima Amphibious Ready Group (ARG) and 26th Marine Expeditionary Units are currently conducting a regularly scheduled deployment to the U.S. 6th Fleet area of operations. Stressing that the Wasp-class amphibious assault ship USS Iwo Jima (LHD 7) along with other units, including the 26th Marine Expeditionary Unit (MEU) and the command staff, Amphibious Squadron 4 arrived off the coast of Israel on March 6, the spokesperson said that the fleet has been deployed to "participate in exercise Juniper Cobra 2018." Whereas other ships cited in the reports, the Harpers Ferry-class dock landing ship USS Oak Hill (LSD 51) and embarked Marines from the 26th Marine Expeditionary Unit (MEU), entered the Black Sea on March 7, 2018 to participate in Romanian-led amphibious exercise Spring Storm 2018, the statement added. Turkish security sources, speaking to Daily Sabah, also dismissed speculation that the U.S. 6th Fleet protecting ExxonMobil. Asserting that such rumors have been made up by media in Greece and Greek Cyprus, the security sources said that it is "a misleading perception." The sources also drew attention to the planned schedule of the U.S. Navy in this regard. The U.S. official underlined that the U.S. 6th Fleet, headquartered in Naples, Italy, "conducts the full spectrum of joint and naval operations, often in concert with allied and inter-agency partners, to advance U.S. national interests and security and stability in Europe and Africa." 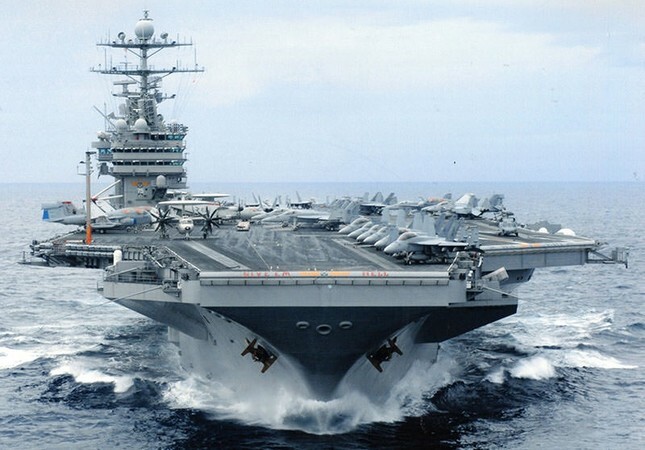 There have been allegations in the Turkish and international media that the drilling vessels belonging to ExxonMobil energy company, which were heading toward the eastern Mediterranean for oil and gas exploration, will be protected by the U.S. Navy's 6th Fleet. Responding to the rumors, Prime Minister Yıldırım said during a joint press conference with Turkish Republic of Northern Cyprus (TRNC) Prime Minister Tufan Erhürman on Wednesday: "All kinds of hydrocarbon resources around the island of Cyprus are the common property of all people living on the island, both those in the north, and the south. Therefore, activities that are unilaterally initiated around the region are never welcomed by us." Turkey's Presidential Spokesperson İbrahim Kalın said Wednesday that Turkey has received confirmation that an ExxonMobil vessel was heading toward the Eastern Mediterranean for oil and gas exploration. However, he noted that he had no information as to whether the U.S. Navy arrived in the region to protect the ExxonMobil vessel. The Juniper Cobra exercise, which the U.S. 6th Fleet will attend, is part of a long-standing agreement between United States European Command (USEUCOM) and the Israeli Defense Forces (IDF) to hold bi-lateral training exercises on a regular basis in order to promote and sustain regional stability and to ensure Israel's qualitative military edge, per the U.S. spokesperson. The U.S. authorities also said that the exercise lasts about three weeks. It is a computer-assisted exercise that is conducted through computer simulations that provide training in ballistic missile defense, crisis resupply, foreign disaster response and foreign humanitarian assistance. The specific focus of the exercise is to improve combined missile defense capabilities and overall interoperability between USEUCOM and the IDF, the spokesperson said.